Amazon Residence is a newly completed condominium development offering a large tropical swimming poolbeaches, salas, sun bathing areas and waterfalls. Even the gymnasium looks out onto the pool!!! 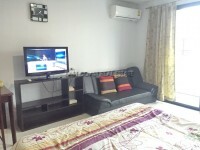 This one bedroom Pool-view unit is on the 7th floor and available for rent or sale fully furnished. It features nice modern furnishing and comes with fitted European kitchenette, 2 air conditioners, flat screen TV and quality bathroom with rain shower. The complex has easy access to both Jomtien Beach and Sukhumvit road. Local markets, convenient stores, restaurants and motorbike taxi's are all within walking distance. Title deed held under Company name for easy and inexpensive transfer.